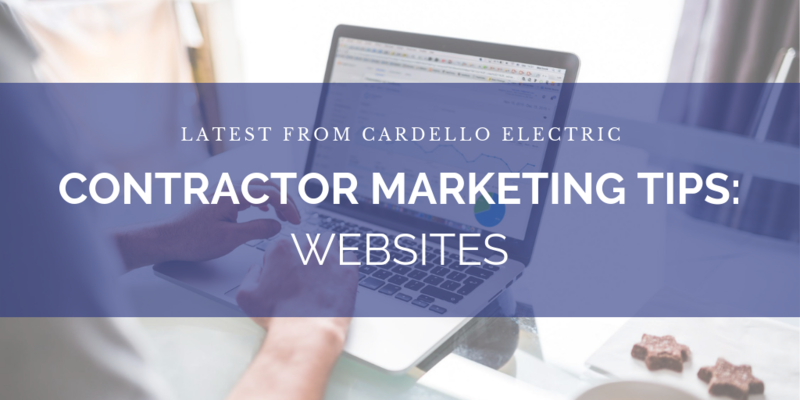 Websites may seem daunting and expensive, but between easy to use website builders and professional web designers, making a website is easier and more affordable than ever. I can’t tell you how many times I have needed an EC’s phone number or address and have scoured the internet only to come up empty. And even if they did have a website or web presence, the information was either outdated, incorrect, incomplete or missing entirely. If your electrical distributor can’t find you, how will your customers? Which brings us back to last month’s article on Google My Business, if you don’t know what Google My Business is, start there. There are a lot of REALLY cool websites out there. Ones with video, gripping content, special effects, etc. You do not need all of that, at least just yet anyways. Keep it short and simple, make your goals attainable. You can always improve later. Your website should have the following items, feel free to add more to it, but as long as you have what’s on this list, you’ll be off to a great start. Take a out a pen and paper and start writing your information down. If you have a business address, use this. If you operate out of your home, list your service area(s). Only write your home address if you are comfortable sharing that with the internet. You may want to consider purchasing a PO Box, which would be more appropriate to list on your website and business cards. Make sure it’s the one you want people to call and change your voicemail message to something friendly that states your business name. Do not use the standard robot greeting! Not everyone likes talking on the phone (I am one of those people). Make it easy on us introverts and list your email address. Make sure it is an email address that is for business purposes only as again you’re putting this online. If you don’t want to list your email address, consider adding a “Contact us” form somewhere on your website. That way people can send you incoming messages through your website without having to give out your email publicly. Tell people how long you have been in business, how your company got started, what education and certifications you have, maybe list some interesting projects you’ve been a part of, etc. This can be as simple as “We provide electrical services to homes in the ________ area.” Or you can list your services in detail, just be sure to end the list with something like “and more!” so people know if they don’t see what they are looking for, that doesn’t mean you don’t provide it. Okay so maybe fuse boxes and wiring aren’t always the prettiest to look at, but it’s still important to show your work. A lot of people are best engaged visually, so seeing you’ve done the work they are looking for might be the reason they choose you over someone else. Just make sure you have permission to publish these photos from the home or business owner. When people are looking for trustworthy work, especially when they are letting you come into their home, they want to know as much as possible about you. If you have a company Facebook, Twitter, Instagram, etc. Link them! Just make sure the content you are publishing on these outlets puts your company in its best light. Hiring? Post job openings directly on your website! Ready to make a website? Great. I personally have worked with Wix, Squarespace & WordPress. I also have built several websites from scratch and can easily work through the challenges novice users might struggle with. If your time is too valuable to spend creating a website on your on your own, a quick Google search for local web designers will have you connecting with a professional in minutes. Plus, the list you put together up there will have your web designer thanking you! If you do want to create your own website, try either Wix or Squarespace. They are going to be the most intuitive applications with a library of tools for you to use. The overall website design will be pre-formatted, but you’ll have plenty of areas to customize (fonts, colors, themes, etc.) The end result will be a great looking, informative, mobile-ready website. There are a few differences between Wix and Squarespace. One of the main differences being Wix offers a free plan while Squarespace does not. But keep in mind if you want a custom domain name (www.thisisadomainname.com) you’ll need to upgrade to premium plan anyways. To read more on the differences between the two, click here.